With its natural reclaimed wood-look top, this cocktail table gives an exceptional look to any room. Its original rectangular shape and chromed metal base provides sturdy support as well as a contemporary look. Use this multi-functional table to compliment your living room. With its natural reclaimed wood-look top, this cocktail table gives an exceptional look to any room. Tap into the magic of summer with the ALLiBERT outdoor coffee table! Manufactured in the Netherlands, ALLiBERT designs easy-going furniture for easy-going people. The attractive 6mm round California outdoor table has a luxurious look and feel. The wicker resin is charcoal in colour and matches the rest of the ALLiBERT California outdoor charcoal furniture line. Every room should have a statement piece: one that exudes the chic style and modern tastes of the homeowner. This coffee series does just that featuring a classic oval-shaped, tempered glass tabletop, and anchored by a solid black base, it is sturdy with lasting appeal. The legs are not what youd find on your average coffee table these legs are pedestals ahead of their time. Artistically styled and inspired by ultra-modern design, the crisscrossed Os are finished in brushed chrome and provide long-term stability for long-lasting enjoyment and use. 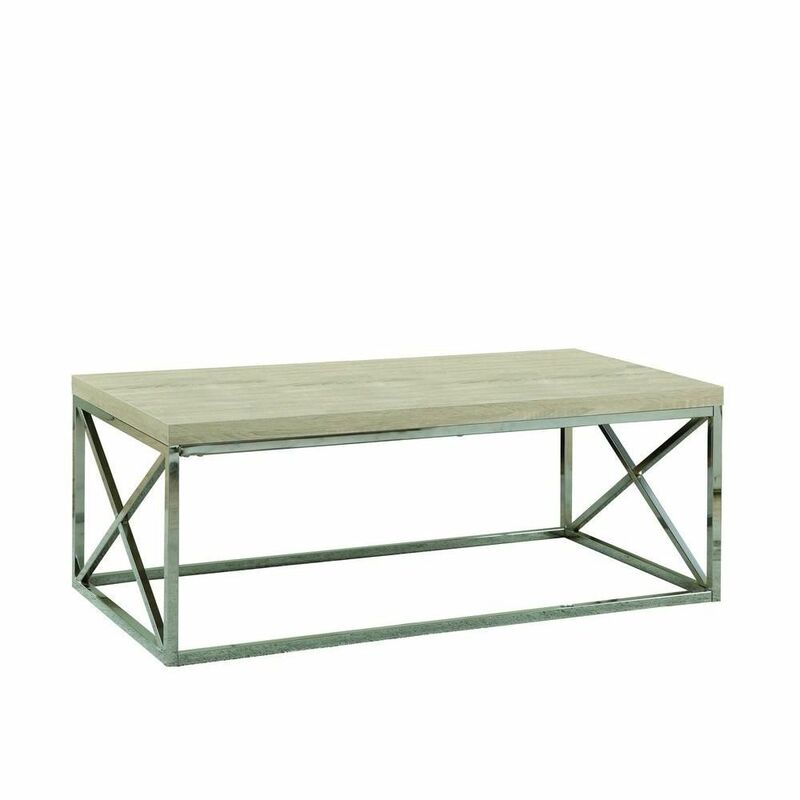 Wood-Look Coffee Table in Chrome With its natural reclaimed wood-look top, this cocktail table gives an exceptional look to any room. Its original rectangular shape and chromed metal base provides sturdy support as well as a contemporary look. Use this multi-functional table to compliment your living room. Wood-Look Coffee Table in Chrome is rated 5.0 out of 5 by 3. Rated 5 out of 5 by Johanne from Coffee Table We are very happy with the three tables we bought! Rated 5 out of 5 by Vinita from Very classy Easy to assemble and solid. Took 10 minutes to to assemble. Delivery was quick. The colour was a little darker than anticipated but still works well. Rated 5 out of 5 by Carlottae from This is a very nice inexpensive coffee table. I am very pleased with the natural color. It arrive... This is a very nice inexpensive coffee table. I am very pleased with the natural color. It arrived sooner than expected and in perfect shape with all the parts. However, I had someone put it together for me .